Chakra is the force energy used by the Naruto characters. The default is “C” for Charge Chakra but only if you have a Headband equipped. “X” for chakra jump and just like Charge Chakra this also needs a Headband equipped. “Ctrl” will allow you to use Chakra Control. For now you can come up from underwater faster and “walk on Water” but now it wont give you that feel. “R” allows you to use “chakra dash” or it may be called a fast run function. You make jutsus by pressing first the right click with nothing in hand! Then you use the numeric keys, 1, 2 and 3 combinations to make a jutsu. The JBRA is Compatible with mods that don’t edit the Render files! JBRA is not Compatible with Render API! 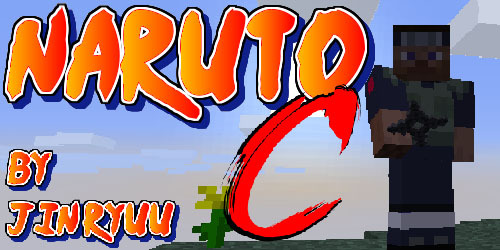 Put Naruto C Mod zip file into your /.minecraft/mods folder. Do not unzip it. Released with 2 new experimental features! Fixed the outfit crash bug and changed the attribute save place (experimental for bukkit servers).